Network for Dialogue: Inspiring civil society to promote interreligious and intercultural dialogue as key enablers for the social inclusion of refugees and migrants. 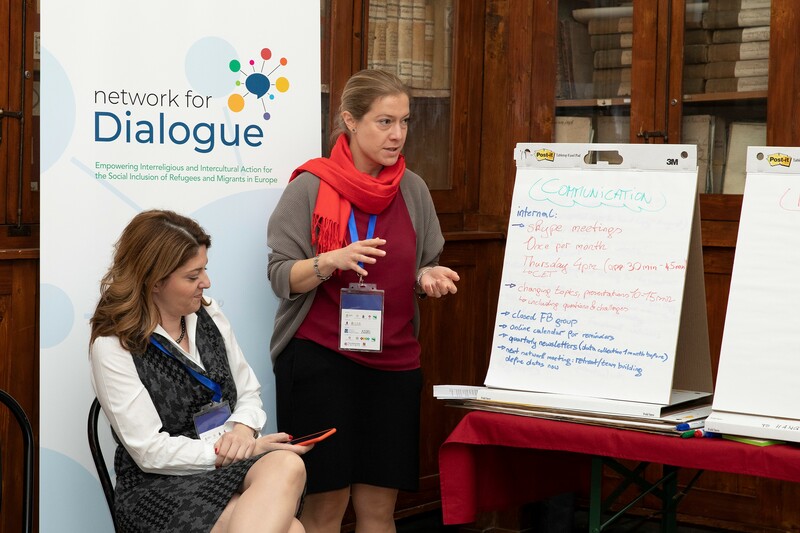 The Network for Dialogue was initiated by The International Dialogue Centre (KAICIID) in order to bring together local faith and dialogue actors from a range of European countries to empower interreligious and intercultural action for people seeking refuge and migrant inclusion. This initiative is based on recommendations from an Expert’s Workshop on Interreligious Education in Europe, co-hosted in 2017 by KAICIID and the European Commission Representation in Vienna, Austria. The Network seeks to build the field of dialogue in order to enhance support for people seeking refuge, while also creating a mechanism for exchange between grassroots dialogue actors, scholars and policymakers. Moreover it provides a platform for developing more effective recommendations for integration and social inclusion policies. Network members are representatives of faith-based and secular organizations, religious leaders, academics and international organizations working in the fields of dialogue and social inclusion with people seeking refuge and migrants. The Network for Dialogue has been launched on the 4 March 2019, and on this occasion the two represenatives of the network will present the work of the network in a short webinar moderated by KAICIID Programme focal point for the Programme for the Social Inclusion of People Seeking Refuge in Europe, Johannes Langer. Learn more about the speakers and register for the webinar below! Violeta Marković is a County Manager in international CSO Jesuit Refugee Service in Belgrade, Serbia. She holds a master’s degree from the University of Belgrade, Faculty of Political Sciences and currently works on her PhD in social work at the same faculty. Violeta’s professional work included social care for children without parents in migrant population and coordinating the work of the Integration House for vulnerable refugees in Belgrade, Serbia. Carl Dahlbäck is a Priest of the Evangelical Lutheran Church Sweden and Vicar Nacka Parish/ELCS, Stockholm Diocese. He worked with Interfaith questions and God´s House Fisksätra Project since 2004. Carl studied Master’s Program of Theology at Uppsala University. Johannes Langer is Programme Manager for the Programme for the Social Inclusion of People Seeking Refuge in Europe. This programme aims to provide integration through dialogue between people seeking refuge and the local host community in Vienna, Austria, as well as convening the newly set up Network for Dialogue to link grassroots organizations within Europe in their work of social inclusion through dialogical approaches. Before joining KAICIID, Johannes worked among other organizations with Initiatives of Change Switzerland and the Universidad de San Buenaventura in Bogota, Colombia. Johannes studied political science, history and international peace and conflict studies at Vienna University, Uppsala University and American University. He lived in nine countries on four continents and speaks German, English and Spanish fluently.